Hey! You started all that silver crap with me! You're the one I got the contrast idea from. I can't believe you don't like the Silver and Black! I'm..I'm.....C-C-Crushed!!! Seriously Snake-- You got a nice classic look happening with the rifle. The scope ruins that. Congrats on the 9.3 project completion, rifle looks great but I've got to agree with the others on the scope issue. Also looking forward to seeing how the various bullets perform for you. This will give me a head start for my someday 9.3x66 A.K.A 370 Sako Magnum project. I used to do business with and occasionally hunt with a guy who did a build on a .338WM. He loaned it to me once on a last minute invite to deer hunt. I killed 3 deer in less than 5 minutes with it. Anyway, he had the builder stamp it .338 (his last name). His last name was Waters. So do what you want but Sako is a name too. I only mention this because I'm backing up to a .280AI build and there is much frustration in the AI community over Nosler asking SAAMI to spec that chambering. It's too long of a story to tell if you haven't followed it, but barrel stampings will matter now. And folks are talking about it. That's fine my friend and i meant no disrespect. I was just saying that things can get dicey these days. Personally when i do my build it will be stamped either SAAMI or 40, with the degree mark. All I was saying is these things are important for posterity. It's something to consider. Took me a day to get my act together and get the order in, but I ordered 50 rounds of brass, 50 Speer 270 grain bullets, and an RCBS 2 die set. Thanks for the help there Jeremy. It made it very easy for me to make it happen. Range report forthcoming in about two weeks. Now where's that enabler MHS? cpj, though I hate excessive recoil, AND I am a recoil wimp, the reason I ordered the lighter Speer 270 grain bullets is because I was being a cheap skate. I think it's gonna whack me about as hard with a 270 grain as it will with a 300 grain bullet, or nearly as much. But $20 bucks for bullets just to zero in the rifle and get used to it, I took the cheap way out. Sako, what case is this 370 Sako made from? That sounds like a REAL thumper. Also, if the silver scope is burning everybody's eyes, I may take bream's advice, "KRYLON!" Because seriously, the scope is pretty nice. What you're saying has merit, but more merit if you use a scope for identifying game. For me I use it to sight the rifle on the game or target. My binos have a lot of resolution and I can see through them with both eyes. Having said all that, in my opinion, Leupold is one of the best American scopes, and they, like Nikon(which I know is not American made), both make some scopes that are clear, with lots of resolution and pass a lot of light, that are well within most of our price range. But like I have said, I don't carry this argument over into target or varmint shooting, or long range work, like someone in Ernies class do. That's different than what I, and most people on this forum do. But I do emphasize that I believe good binoculars should be an essential part of our hunting gear. Not to mention the safety and improved vision of binoculars, you're much less likely to be seen by game than when scoping out the field with a scoped rifle. Thanks buddy, and this is part yours. You were my "Primary Enabler" here. I have loved this Ruger since I bought it used. It was a very respectable rifle in 30-06, and I am MORE than confident it will be a great game getter as a 9.3. One thing, with the right ammo, I think I have all my bases covered with the addition of this to my collection. Yeah maybe. But then maybe I am drawn to that number. I noticed Sako mentioned a "3"70 Sako. Do you think he might be similarly afflicted? I mean after all, he does appear to be afflicted with this "Sako" thing. Well, when I do acquire a 370 Sako it will be fed 286 grain bullets as intended. :jester: My 270 however, is not a Sako tho that may be remedied someday as well. And to answer your previous question, the 370 sako case is basically a 30-06 derivative as well. Little longer and different shoulder as I recall without looking it up. The 9.3x62 case isn't as long as an 06 over all, but it holds more volume because it's longer from the base to the shoulder and the case has less taper. The 06 holds about 70 grains of water and the 9.3x62 holds almost 75 grains. Isnt the 06 case 63mm? Sho Nuff! The 06 is a Silly Milimeter longer than the 9.3x62. But the 9.3x62 has a tad more volume for powder. As I said, it holds about or just a hair under 75 grains of water and the 06 a hair under 70 grains. 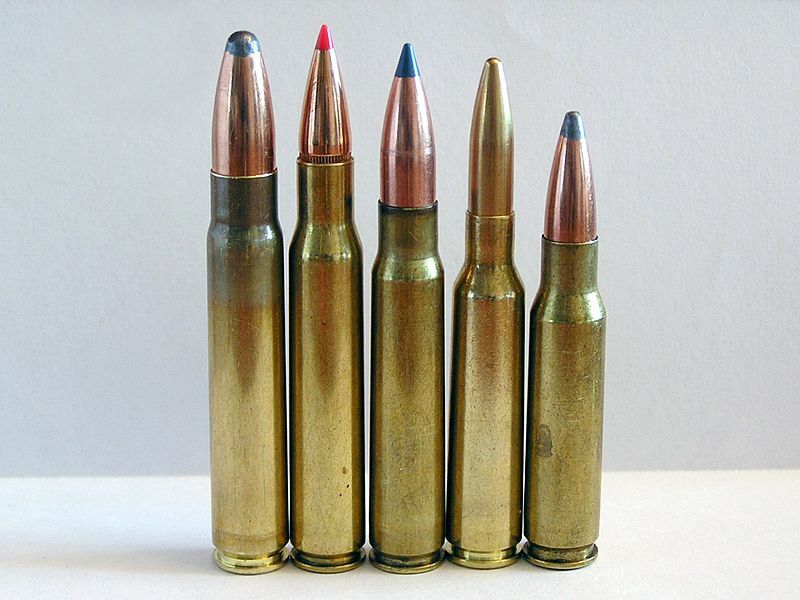 Think of the 9.3x62 as being an Ackley Improved 06 (other than the much bigger bullet diameter). In fact, I read where 06 brass can be fire formed in a 9.3x62. But I was wondering how the slight difference in the case rim diameter would effect the brass? I guess you could neck the 06 case up and fire form it. But will the case head space in the 9.3 where you can fire form with factory or hand loads? or do you need to fire form with low pressure loads with a small amount of powder and lots of corn meal or some other filler? I'll search around. What I've read so far hasn't addressed that issue. Browsing around, the suggestion I read was to anneal the cases prior to forming. Probably because of the larger bore and moving the neck forward. It also seems to have less taper, so it may help with that, too. Not to throw fleas all over your new 9.3 x 62 rifle, but don't you really have a kinda 35 Whelen? When I look at the numbers, it seems to me that the German round is so close to the much easier to find 35 Whelen that it would be a good way to go, just spring for the "Merican round. OTOH I respect the charm of having the 9.3. Great Big Bear/Elk rifle. I have neither and like both. Not to throw fleas all over your new 9.3 x 62 rifle, but don't you really have a kinda 35 Whelen? Kind of like a .338/06 is like a 35 Whelen? There is enough difference there to make it interesting. Got my shipment from Midway. I stuck three bullets in three cases to see how they would fit my magazine. Worked like a charm. 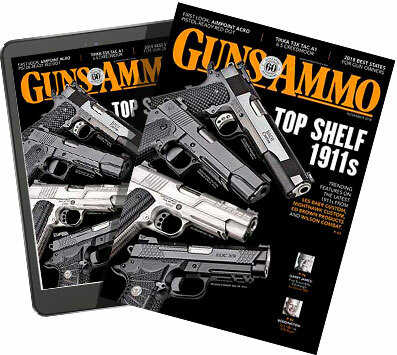 I got to wondering if the magazine was big enough for 270-320 grain bullets. Tomorrow, I'll pull the bullets, prime the cases, and drop powder and resateseat the bullets, since I have the bullet seating die set now. 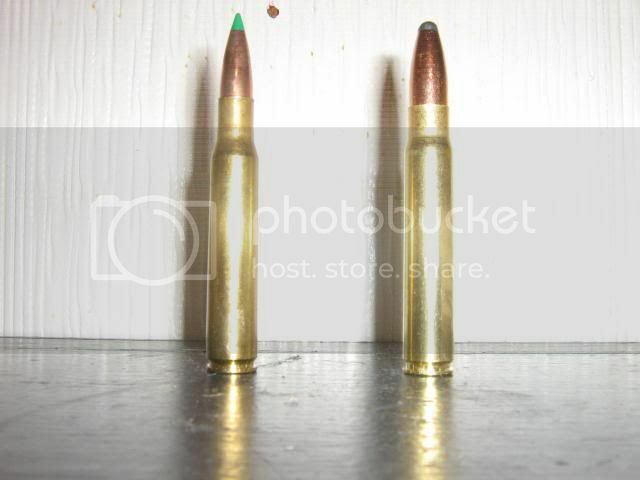 The round on the left with the 150 grain NBT bullet (for comparison sake) is a reload for this same Ruger rifle when it was a 30-06. Of course, the round on the right, with the big bullet, is a 9.3x62. I guess I'll pull all those bullets from the 06 rounds and dump the powder and full length size the cases and put them back together to shoot in my Remington 06, since they were neck sized only. I have about 40 of them loaded up. I have the amount and type powder written on the box so I can re drop the powder. I'll take the decapping pin off the sizing die to full length them all and hope the primers don't go off.